One of the immediate difficulties is how to define when an Interglacial occurred in the past? In a number of cases, the long-term pattern of temperature versus time shows a long Ice Age followed by a relatively sudden termination, which in turn is followed by a period of warmth we call an Interglacial. In other cases, there are short upward temperature excursions during an ice age, and it has been debated whether to call these Interglacials, or not. An Interglacial can be defined as a unique interruption in an Ice Age, that occurs in a very mature Ice Age after a rapid termination, leading to a warm period of 5500 years that might be extended another 20,000 years in some cases. The Interglacial begins the transition to an incipient new Ice Age over a range of time that can be defined in several ways. 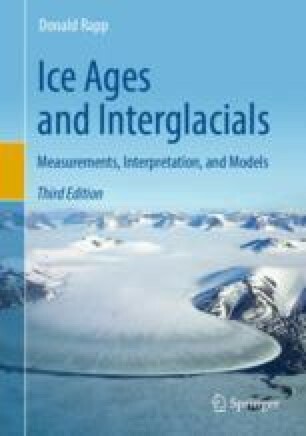 The duration of an Interglacial depends on the measure used to define it. As an Interglacial matures, sea level remains high. Ice may start accumulating around 65°N latitude after 5500 years, but the initial impact on sea level is small. If the duration of an Interglacial is defined by sea level, it will certainly be much longer than 5500 years. If an Interglacial is defined as the period until the new ice sheets start to form, it will be quite a bit shorter than the duration measured by sea level. Past Interglacials typically had CO2 concentrations similar to the current Interglacial, but some were warmer than the current Interglacial. Due to the rise in CO2 and the large amount of dust and soot deposited on northern ice and snow, it seems likely that the current Interglacial will persist and a new Ice Age will not develop.